Horwich's first railway station was actually the station that is now called Blackrod; originally called "Horwich Road" then "Horwich & Blackrod" it became "Horwich Junction" in 1870 following the opening of the branch to Horwich Station, which opened for goods traffic on 15th July 1868 and passenger traffic on 14th February 1870. Fourteen years later in 1884, the Lancashire & Yorkshire Railway made the decision that would change the town of Horwich forever by relocating their Locomotive works from Miles Platting and purchasing a large amount of land in Horwich for the purpose. 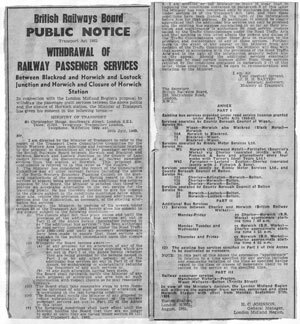 Public Notice which appeared in newspapers regarding the withdrawal of passenger services to Horwich and the closure of the station. The branch line from Blackrod then took on an extra role servicing the works, and another main line connection opened in 1887 providing a direct connection towards Bolton at Horwich Fork Junction. 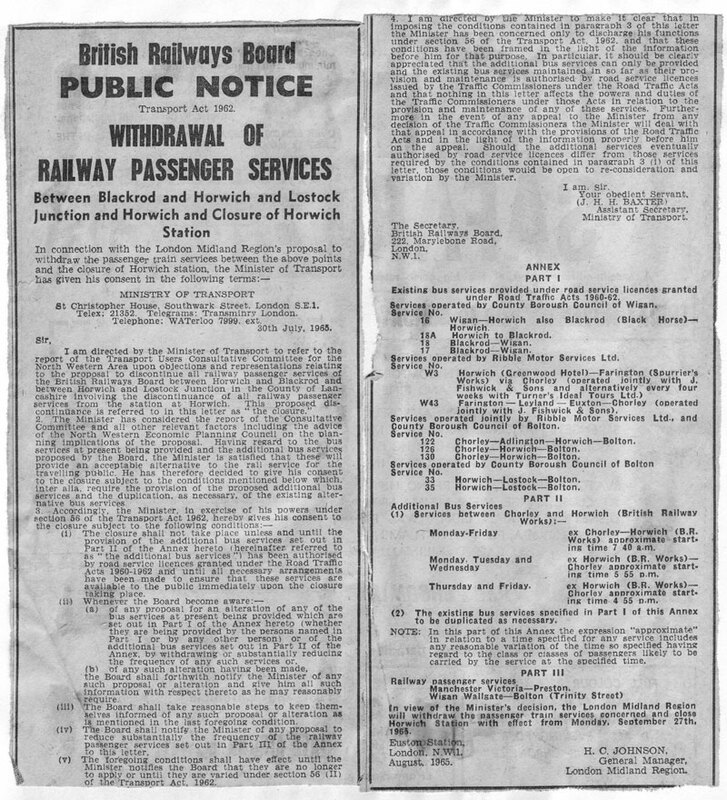 However, 95 years after the first passenger train ran, the station fell victim to the wholesale closures caused by Dr Beeching's report of 1963 and the last passenger train left on Saturday 25th September 1965. The goods station managed to hang on briefly, closing in 1966. The south fork link to the main line closed, but the north fork remained to service the Loco works which itself survived until 1983. During the 1970s, a group called the "Red Rose Live Steam Group" put forward comprehensive plans to restore the station, create a museum, and re-lay track to the branch platform at Blackrod station to be run as a preservation society. Unfortunately, the plans met with both council and local opposition and the opportunity was lost for Horwich to gain both a major preservation centre and tourist attraction. The group instead went on to set up Astley Green Colliery Museum. In 1980, the land occupied by the station was landscaped into a recreational park which was officially opened 25 years to the day after the last train left. Horwich Loco Junction - The lifted line ahead once lead to Horwich Station, while the line to the right was retained to service the Loco works. The signal box would have been just out of shot on the right of the picture. 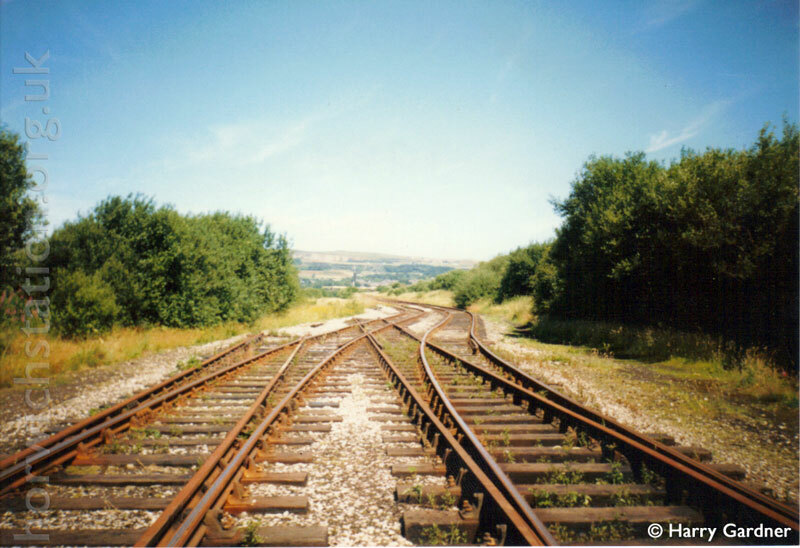 With the closure of the loco works in December 1983, all remaining track from the main line has now been lifted; some of the trackbed survives as a footpath, but some has sadly been built over. Where possible I will try to show 'before and after' on this website. In 1997, a group of enthusiasts, some of whom were present on the last day in 1965, including Paul Salveson, led a campaign to reopen a station at Horwich together with a new link to the mainline. This unfortunately, did not receive the necessary backing but did result in the construction of a new station in 1999 adjacent to the Reebok stadium. Ironically, today, Blackrod railway station is still closer to the centre of Horwich than the station which now bears the Horwich name.